Meet Boomer. 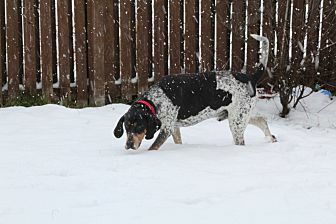 He is a 5 year old blue tick coonhound. He is a big sweet boy. Boomer loves everyone. He will try and pull you towards people to say hi. He gets very excited when people do come to great him. He does sometimes try to jump up. We are working on that. We are also working on leash manners because he is very strong and will try to pull. The gentle leader is helping a lot. Due to his size I would recommend older children. He does not realize how big he is and could knock down a little one. We are working on manners right now. He does try and jump. He also looks like he may counter surf. He is a horrible beggar and will try and steal food. He has also tried marking in the house a couple times. Boomer is good with other dogs. Overall he mostly ignores his foster sisters. He is happy to let his little sister be the alpha. He has not been around cats yet, so we do not know how he will do. Boomer has not shown any interest in toys or playing. He just loves being with his people. He will smother you if you let him. He is a great dog. This dog is altered and up to date on shots. If you would like to meet this dog please call Annie at 815-685-0746. The adoption fee is $225.